Until now, I've always used bottled marinades for grilled meats and veggies. There's always something fun at Trader Joe's that I want to try. But now that I (sorta, kinda) know how to cook, I decided to make my own for our Memorial Day grill-fest. After a little Food Blog Search time, I chose to base my concoction on this recipe from the ever-reliable Kalyn at Kalyn's Kitchen. It was fantastic; another go-to recipe added to my repertoire! I'm calling this my Made-Up Marinade because I grabbed anything in my kitchen that looked good and threw it in, making up the mixture as I went. It will probably never be the same twice. It was great on veggies, and the chicken was by far the moistest we've ever made. I used boneless, skinless chicken breasts, classic grilling veggies (peppers, onions, zucchini, mushrooms, cherry tomatoes), and my favorite: pineapple. Cut everything in relatively uniform chunks before arranging on the skewers. Whisk all ingredients (except veggies and chicken, obviously) together in a medium bowl. Place veggies in one Ziplock bag, and chicken in another. Pour half of the marinade into each bag, seal, and shake well to coat. Refrigerate until ready to grill, at least an hour. 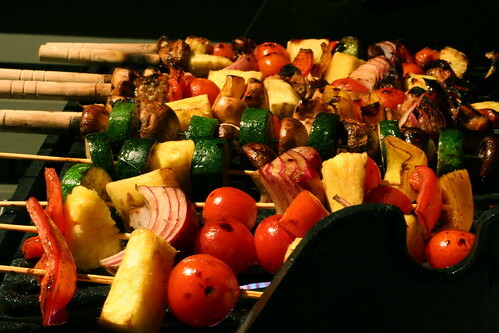 Arrange veggies and meat on skewers and grill on high on a preheated grill until chicken is cooked through and veggies are nice and charred, and turning occasionally, about 15-20 minutes. That looks great. Good idea. That looks delicious. I can't wait to starting BBQing! "except veggies and chicken, obviously"
Homemade marinade > store bought marinade all day long. If you like the food blog search, you can add the widget to your page (I did). I was unaware that it was a project of Elise's (simplyrecipes.com) until I got an email from her when I asked them to include Imafoodblog. @nick Thanks for your feedback! I actually do have the Food Blog Search widget, it's a small one down there on my sidebar towards the bottom. I credit Food Blog Search with teaching me much of what I know about cooking. Oh yum...I have to do something like this on the grill soon. It looks great! Welcome to CEimB! Looks great! i love grilled veggies!